MÜNSTER -[Sea monsters] Les monstres marins & terrestres..
MÜNSTER,S. - [Sea monsters] Les monstres marins & terrestres..
[Sea monsters] Les monstres marins & terrestres.. - MÜNSTER,S. 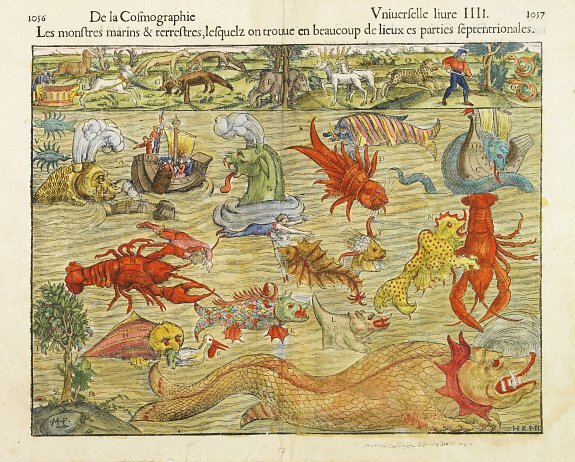 Description :Münster's plate of monsters of both land and sea, taken from Olaus Magnus' 'Carta Marina' of 1539, with abundant tusks, horns and twin-spouts. One vignette shows a galleon trying to outrun one monster by throwing their cargo overboard, while one sailor takes sight with a musket. Across the top is a panel showing land-based creatures. One of the more fanciful cartographic curiosities and a unique view of Renaissance attitudes toward the 'unknown' lands beyond the civilized world. Condition : Wood block print with letter press. Paper browned as usual. In original colours with later colour additions.